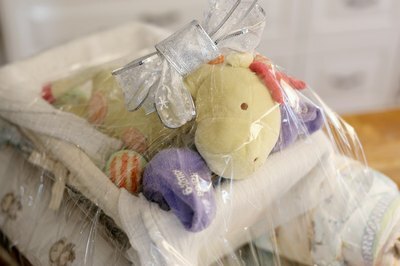 A diaper cake is comprised of single or multiple layers of wrapped or rolled diapers and given to mothers-to-be and new mothers to welcome a new baby. Baby shower hosts and other gift givers have used the basic diaper cake to develop a multitude of creative ways in which to present this useful gift to a mother-to-be. Four-wheeler diaper cakes are a simple project that can quickly become the centerpiece of any baby shower. 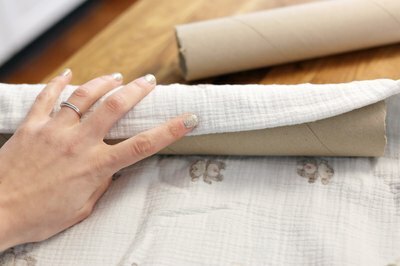 Cut the cardboard tube from a role of wrapping paper in half. Wrap a receiving blanket around one of the tubes and secure it at both ends with an elastic or ribbon. Wrap the other half with a receiving blanket as well and secure it in the same way. Wrap a diaper around the end of one of the receiving blanket-covered tubes. Secure the diaper with an elastic band. Continue wrapping diapers around the first diaper until the roll of diapers reaches a diameter of approximately 6 inches. Repeat this step on the other end of the tube and then on the other tube to form the wheels. Wrap a 2-inch-wide ribbon around each roll of diapers and tape the ends together. Place the two tubes onto a rectangular plastic cake tray and arrange the tubes and diaper rolls so that the taped ends of the ribbons are facing downward. Lay a baby blanket out on a flat surface and fold it in half. Fold it in half again so that it makes a long rectangle. Place an empty plastic basket in the middle of the blanket and fill the basket with baby items, such as teething rings, pacifiers, baby bibs, booties, hats and bottles. 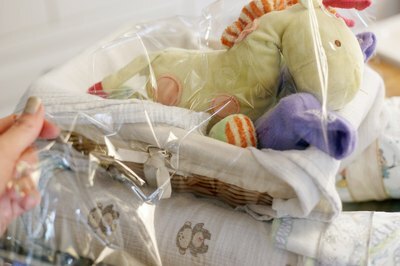 Wrap one side of the blanket around the basket and tuck a baby bottle on top of the basket and underneath the blanket. Wrap the other side of the blanket around the basket and tuck any leftover end under the basket. Balance the basket on the cardboard tubes in between the diaper tires. Wrap a baby bib into a tight roll and slide a baby sock over the bib. Repeat this step with another bib. Place a medium-size stuffed animal on top of the blanket-covered basket and tuck the sock-covered bibs in front of the animal, sticking upward to look like handlebars. Wrap the entire cake in cellophane wrap or tulle netting and tie a ribbon into a bow at the top to prevent the diaper four-wheeler from shifting.